Contrary to their hunting reputation, Stone Age Siberians killed mammoths only every few years when they needed tusks for toolmaking, a new study finds. People living between roughly 33,500 and 31,500 years ago hunted the animals mainly for ivory, say paleontologist Pavel Nikolskiy and archaeologist Vladimir Pitulko of the Russian Academy of Sciences. Hunting could not have driven mammoths to extinction, the researchers report June 5 in the Journal of Archaeological Science. On frigid tundra with few trees, mammoth tusks substituted for wood as a raw material for tools, they propose. Siberian people ate mammoth meat after hunts, but food was not their primary goal. Several European and North American sites have yielded single mammoth carcasses lying amid stone tools. Such finds could reflect either hunting or scavenging. Finds at Siberia’s Yana archeological site provide an unprecedented window on the hunting and killing of mammoths over a long time period, says archaeologist John Hoffecker of the University of Colorado Boulder. Mammoth bones appear in sufficient numbers at some sites in Europe to suggest that hunters there did seek more than ivory, says archaeologist Jiří Svoboda of Masaryk University in Brno, Czech Republic. Whatever happened at Yana, many groups were probably interested in obtaining mammoth meat, fat, bones, tusks and skin, Svoboda says. 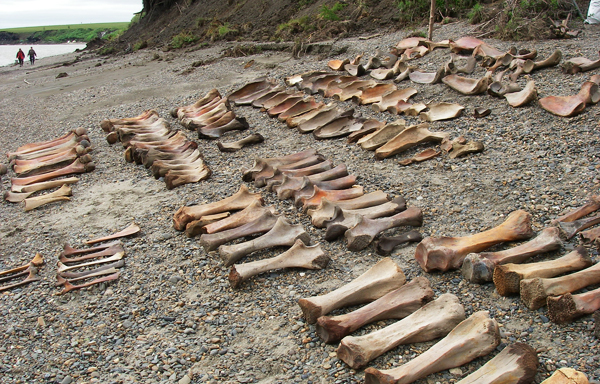 Since 2008, scientists have unearthed 1,103 bones from at least 31 mammoths at Yana. Radiocarbon measurements indicate that mammoth remains gradually accumulated there over 2,000 years. Right shoulder blades from two mammoths contain pieces of stone spear points. An ivory splinter, possibly from a spear’s shaft, pierced one of these bones. Another shoulder blade and a thigh bone display holes made by spears. Angles of these wounds suggest that hunters struck mammoths from behind. “Yana people definitely attacked from the mammoth’s blind spot,” Nikolskiy says. Most mammoth bones at Yana come from animals with slightly curved tusks that were the best size and shape for making hunting weapons, Nikolskiy and Pitulko propose. Researchers have found five mammoth bones from the base of the animals’ tongues at a campsite not far from where remains were excavated. Meaty parts of the animals were probably consumed there, the investigators say. While hunting was not the main cause of mammoths’ extinction in Asia and Europe, it may have been the last straw as warming temperatures shrank livable areas for the creatures. P. Nikolskiy and V. Pitulko. Evidence from the Yana Paleolithic site, Arctic Siberia, yields clues to the riddle of mammoth hunting. Journal of Archaeological Science. Published online June 5, 2013. doi:10.1016/j.jas.2013.05.020.